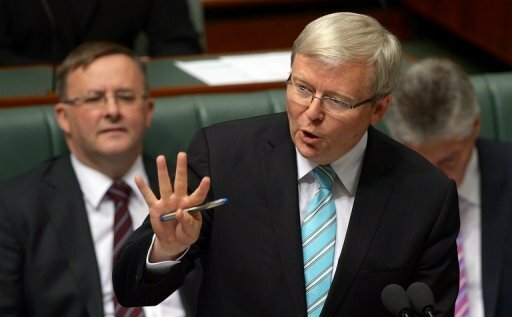 Australian prime minister Kevin Rudd (C) speaks at parliament's House of Representatives in Canberra, on June 27, 2013. As he seeks to build support for his centre-left Labor Party ahead of elections due this year, the newly-reappointed Rudd declared that the unpopular tax, which charges the country's biggest polluters for their carbon emissions, will move to a floating price from July 1, 2014. "The government has decided to terminate the carbon tax, to help cost-of-living pressures for families and to reduce costs for small business," Rudd told reporters in Townsville. "From July next year, Australia will move to an emissions trading scheme, one that is used around the world including in countries like Britain, like Germany and soon in China." Rudd said the result would be that the carbon price, which was to be fixed at Aus$25.40 per tonne for 2014-15 would drop to about Aus$6 a tonne, translating into annual savings of about Aus$380 for an average household, mainly due to lower gas and electricity bills. Rudd was reinstalled by the Labor Party last month, three years after his own dumping in favour of Julia Gillard over issues including his inability to pass a much-vaunted emissions trading scheme. Though he was unpopular within party ranks, Rudd is widely liked by voters and centre-left Labor hopes his resurrection will help it secure a third term in elections later this year. The prime minister said the changes announced Tuesday would still mean that Australia would play its part in reducing carbon pollution to combat climate change. "I am certain that we are taking the correct action," said Rudd from Townsville, a city on the doorstop of Queensland's Great Barrier Reef, a natural icon which it is feared will be impacted by global warming. "We want our kids and our grandkids... to be able to enjoy one of Australia's greatest natural assets. We don't want them to be able to just read about the Great Barrier Reef in some history book in the future." Gillard's popularity dived after she vowed not to introduce a pollution tax ahead of the 2010 election and then changed her position, bringing in a deeply divisive levy designed to move to an emissions trading scheme within three years. Bringing forward the start date of emissions trading from July 2015 will cost the budget about $3.8 billion over the next four years in lost revenues and Rudd said this would be offset by cuts, including by tightening tax concessions for employer-provided cars.